Jim Flanagan is one of the most knowledgable and effective strength trainers in the world, and served alongside Arthur Jones during the Nautilus and MedX founding era for 36 years. 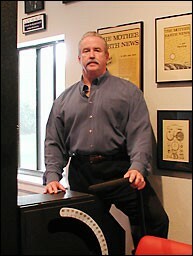 In 2017, Jim Flanagan was inducted into the National Fitness Hall of Fame. In this podcast episode, Jim Flanagan joins me for a Part 2. This was even better than the first episode and Jim and I cover a lot of interesting topics within high intensity training, body building, and the fitness business. QUESTION(S) OF THE DAY: What was your biggest takeaway from this episode? I’d love to know. Please let me know in the comments below! Excellent interview ! A lot of wisdom and insight from Mr Flanagan , it was a pleasure to listen to . Thank you Enlite. It was a joy to record and glad it’s been received well. Fantastic interview Lawrence, Jim Flanagan has an amazing ability to get his message across. He has an absolute wealth of knowledge and historical background on the subject, and just so good to listen too! I enjoyed this interview. I listened to the entire podcast twice. Mr. Flanagan is right about territory rights in relationship to professional trainers. The only thing I could find disagreeable were his comments about people’s opinion. There are people who are qualified in their respective fields and who have expert opinions. After a period of time…..these type of opinions generally can be trusted after critical thinking is used. 10 days recovery…..based on his personal record keeping….interesting. He too stated that HIT lost. Maybe HIT needs some sterling examples. Health was mentioned…but nothing about prevention of the # 1 killer….heart disease. Does HIT prevent heart disease?? ?…perhaps….to some degree. Certainly the proof …..those experts mentioned above…..is missing. Appreciate your comment Marc. Would be good to get someone on the podcast to talk more specifically about exercise and the prevention of heart disease. I’ve replied to you previously. It is very difficult to reply to anyone on the “net” because one can hide their true character behind a keyboard. I am trying to curtail all internet discussions due to the unproductive nature of such discussions as this. I learn very little from such replies as these. Your question should be directed to an exercise specialist such as Kenneth Jay PhD or at least a cardiologist. I have access to a cardiologist (M.D.) who has answered my questions on cardiovascular conditioning. We do currently know some beneficial things about cardiovascular conditioning. Resistance training does not have a sterling reputation as a cardiovascular conditioner. Can anyone take the risk to not include beneficial exercise such as cardio? Perhaps in time the subject that you brought up in the nytimes article will be addressed fully. I hope so. I personally would question why there is not more concern over the misinformation concerning cardiovascular conditioning on HIT sites. I personally am more interested in conditioning my lungs, heart, and blood vessels efficiently. I don’t believe that there is any empirical, scientific, or logical evidence to propagate a resistance-based-only exercise training modality as a primary tool to enhance heart, lungs, and blood vessels function. It is sad that the HIT community does not “call out” misinformation being levied by the SuperSlow/BBS/Max Contraction hysteria on healthy exercise regimentation choices. Take time to review what a former SuperSlow trainer Steve Maxwell states here on this site. He is no longer a SS disciple. Or better yet, read what Lyle McDonald states on BBS/Superslow, or Alan Aragon on the Paleo diet. My own personal evidence shows the importance of regular cardiovascular training can help condition the heart, blood vessels and lungs. Any decent textbook on the Kreb’s cycle can make “global metabolic conditioning” seem like such a silly idea. The video represents a biased HIT viewpoint! If you believe this HIT paradigm fully, then all an endurance athlete needs is a weekly weight workout. That is absurd. No experts in the field of endurance train this way. The body adapts to endurance activities differently than anaerobic activities. That is why global metabolic conditioning is garbage. Both aerobic and anaerobic activities can be useful. However, endurance training is much more important for healthy everyday living. By the time one reaches old age….lung capacity, maximum oxygen uptake, decreases significantly not to mention a general stiffening of arteries and unfortunately the heart declines with age. Unlike a HIT paradigm, a reasonable cardiovascular program can keep these vital organs functioning at higher levels. Lung function can be MEASURED with a spirometer. Why does no one in HIT mention this….because even circuit weight training does not illicit a large VO2 max, thus doing a poor job of conditioning the lungs. Have Steve Maxwell discuss aerobic conditioning again. Have Luke Carlson discuss aerobic conditioning. Best of all, have Lyle McDonald, Phil Maffetone, Clarence Bass, and most of all Kenneth Jay discuss aerobic conditioning. The death of aerobics by HIT experts was greatly exaggerated. While we are still talking, and I don’t get banned here, let us renew discussion on the benefits of stretching. OK? Good point James, but there are some manufacturers (e.g. ARX) who are trying to cater for the strength training focused business. Just not the norm unfortunately. I forgot to comment about one gripe here. The Colorado experiment is 0% science, it can tell us virtually nothing. I watched this https://youtu.be/mYhsbVlyyDc clip today from Steven Novella, containing lots of info about the problems with even rigorous study design (first 5 or so mins can be skipped for the short of time).